I enjoy teaching very much, and believe that the most effective way to contribute to durable social change is through education. As such, my classes focus as much on exploring one’s assumptions and world-views as they do on conveying scientific or technical knowledge. I think this is an important aspect of a liberal arts education in the 21st century—with so much societal focus on STEM education, critical and lateral thinking is in danger of being left behind. My own undergraduate and graduate training involved a combination of studies in the social and natural sciences, the liberal arts, and the philosophy of science. This interdisciplinary mix of perspectives and tools was essential to my success through graduate school, and to my growth as a successful trans-disciplinary researcher. My goal as a teacher, therefore, is to draw from these same fields to provide my students with the tools to think critically and synthetically, and to develop an aptitude for both cross-pollination and cross-cultural understanding. In the classroom, I play the role of mentor and lead-learner, trying from the start to break down the traditional power dynamic (i.e., scholar imparting knowledge to student), which I think undermines effective learning. Instead, I strive to create a safe and inclusive learning environment. Discussion is the most important aspect of all my classes, so I draw on a variety of interactive exercises in addition to short lectures to set the stage for meaningful sharing and exploration. I also structure group work and online discussion activities such that people with different learning styles and levels of comfort regarding public speaking can all participate in the manner that they are most comfortable. I likewise emphasize the value of multiple ways of knowing and cross-cultural communication in my classes. Over the years, my classrooms have regularly included Indigenous students, as well as others from diverse cultural backgrounds; I have repeatedly found that students engage more with the material and with their peers when they feel themselves to be a valued participant in the conversation. I consider research to be a valuable component of a university education. Likewise, I consider undergraduate and graduate researchers to be vital to the success of meaningful and effective research. As an advisor and mentor, I treat my students as peers. I encourage them to be comfortable with an iterative and flexible approach to research design, with the primary focus being science that is problem oriented and driven by the needs and concerns of community partners. While I emphasize the importance of careful and thoughtful work, I also require that my students pay close attention to making and keeping timelines, maintaining progress, and preventing ‘scope-creep’ in their projects. Because I understand the social sciences as being no-less ‘real’ and no more subjective than natural sciences, I prefer that all of my students take courses in experimental design and the philosophy of science, as well as environmental justice and research ethics. Finally, I strive to train scholars who are socially- and civically-minded, and encourage my students to learn about the broader societal context for their research, while advising them to explore innovative outputs for their research in addition to traditional peer-review venues, including open-access journals, blogs, and K-12 outreach. Scores (out of 5) from my undergraduate capstone course. I took student feedback very seriously following Year 1, and you can see that I have succeeded in improving the course since. I take student feedback very seriously. I also value transparency and accountability, and for that reason, I post my student evaluations for each class here on my website for all to see. Teaching, for anyone, is a work in progress. A dedicated teacher has to be dedicated not just to their expertise but to learning and growing as a teacher and mentor. I believe that these files show both that I have found great success as an educator, but also that I eagerly strive to improve my skills in this area. 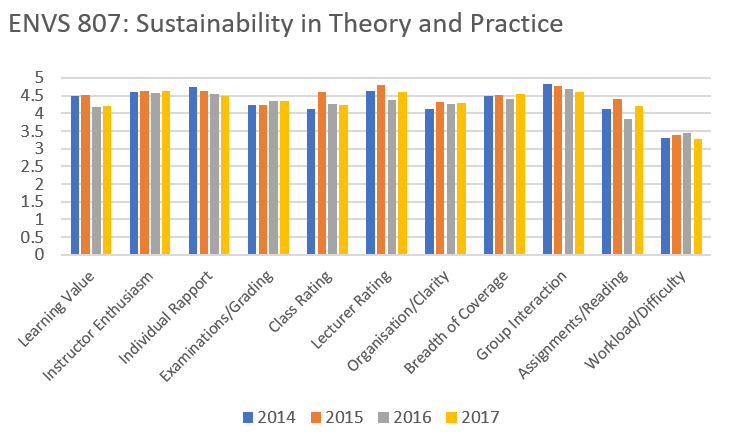 Score (out of 5) of my graduate-level introduction to sustainability course. 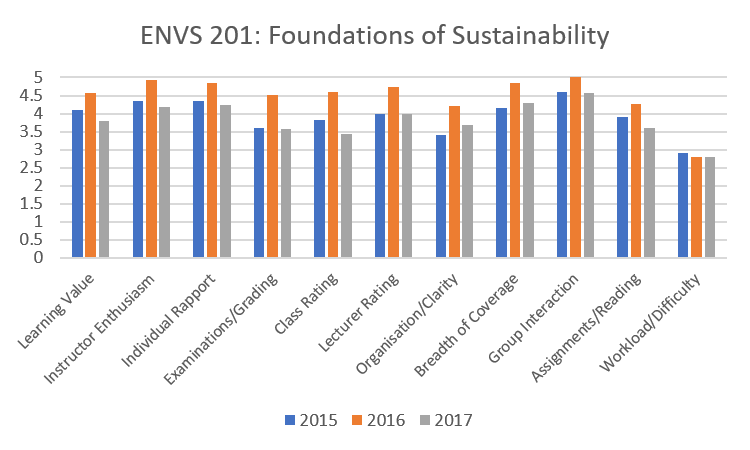 Score (out of 5) of my undergraduate sustainability foundations course.